owlet, originally uploaded by jahansell. Driving past the graveyard at 6:30am, someone crouched on the path caught my eye - he looked like maybe he was trying to feed a kitten. 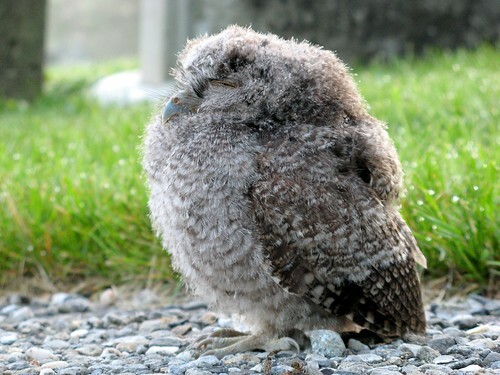 Of course I had to go see, and it turned out to be our neighbor, Peter (proprietor of the Pink Cloud Gallery) watching this tiny (6" high, maybe) baby owl, sleeping on the path. I'm sure it shouldn't have been there and would be easy prey to any 4-legged carnivore, so I made a call to try and have someone come rescue it. Anyone got an ID for me? I'm thinking screech owl, but maybe Barred Owls start out tiny? They're the two most common around here. UPDATE: ThatBirdGuy, aka Nature's Notebook author, says Great Horned! What a fabulous photograph. I do hope this little bird gets rescued if he needs rescuing. Love that allium photo. I've seen those around here in Ohio. Apologies for lack of comments recently. I'm in America. But slowly, am catching up and starting to comment a little more regularly. What a marvellous photo of this baby-owl. I hope it got rescued or looked after properly. Thanks for telling me about this. I am sure the parents were watching you and they know the baby is there and if they are large enough there will not be anything bother it as they are all fearless in attacking anything that tries to get to their babies. I suspect it fell out of its nest and got that far trying to find some cover.